Yamaha MusicSoft Blog: Yamaha Keyboard and Disklavier News: Guns N' Roses, Lady Antebellum, Taylor Swift, & More Added to NoteStar! Guns N' Roses, Lady Antebellum, Taylor Swift, & More Added to NoteStar! We're happy to announce that we've added another 12 hit songs to the NoteStar catalog! 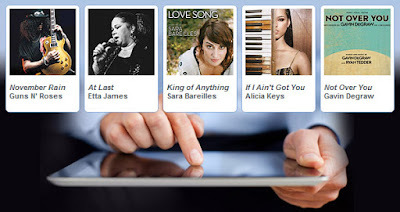 Tap the "New Songs" banner in the NoteStar store to preview the latest additions from piano maven Sara Bareilles, pop-country superstars Taylor Swift and Lady Antebellum, or check out our staff's personal favorite "November Rain" from Guns N' Roses! We'd love to hear about your experience with NoteStar! Take a moment to drop by the NoteStar Facebook page and say hello! The first 5 fans to post a video of their NoteStar performance will get a FREE SONG*! We're already talking about version 2 of the App, but need to get some feedback from our NoteStar customers first. Tell us what you think by participating in a very quick survey, and have a hand in shaping the future of the app! *To receive a free song for posting a video on Facebook, you must be registered with Yamaha Online Member.